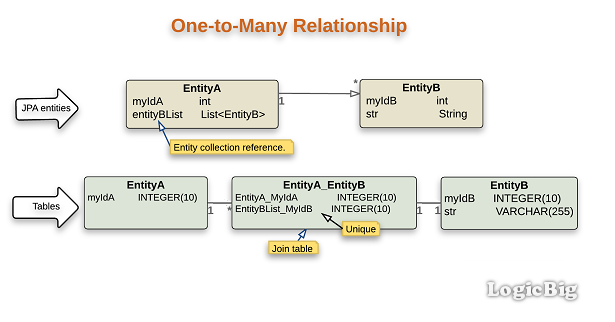 In one-to-many association, a Java object (JPA entity) has a collection reference of another entity. To map one-to-many association to database tables, @OneToMany annotation is used on the collection. We don't use any annotation on the target side unless it's a bidirectional relationship. A middle 'join' table is mapped along with two tables, each for the source and the target entities. In the join table, there is a unique key constraint on the target foreign key column (the one pointing to the target entity), that's because exactly one instance of the target entity should be populated in the source collection, otherwise it will become many-to-many relationship. Having a unique foreign key for the target table also means, our collection (e.g. List) cannot have duplicates. Note that, in above output, there's a UNI (unique key) with ENTITYBLIST_MYIDB. In this example, we are entirely relying on the mapping defaults. The join table, by default, has a name which is generated by combining the two entity names, appended with an underscore between them. If we want to change that we can use @JoinTable annotation. We will explore that in the next tutorial. In this example, we are going to populate EntityA#entityBList with unique elements. What will happen, if we attempt to persist duplicates in EntityA#entityBList, let's check that out.